History has been made - a new Ballon d'Or winner has emerged. 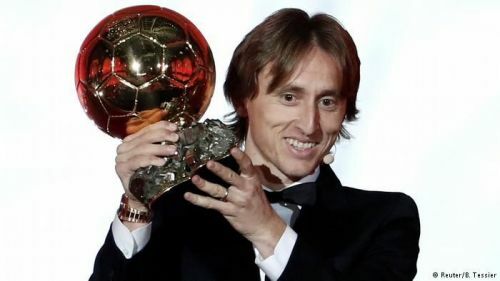 Real Madrid superstar Luka Modric has finally conquered the football world, beating both Lionel Messi and Cristiano Ronaldo to claim the coveted prize and becoming the first player to do so in 10 years. It has been a very successful year for Luka Modric - actually the best one he has had in his career so far. The Croatian International had initially claimed both the UEFA and FIFA Player Of The Year awards recently, but the Ballon d'Or award proved to be quite tougher as he had to battle it out against a number of France's World Cup-winning stars including Antoine Griezmann, Kylian Mbappe, and Raphael Varane, not to mention the stiff competition he faced from Lionel Messi and Cristiano Ronaldo as well as other superstars. Despite the intensity of the competition, Modric was able to stand till the end, with his performances and achievements during the year coupled with other factors helping him to be named the finest footballer on the planet this term. Below, we take a look at four things that aided his Ballon d'Or triumph. There are many things that helped Luka Modric on his way to claiming the Ballon d'Or award this year, winning the UEFA Champions League is actually one of them. Modric was an unbeatable force in the middle of the pitch during the coveted tournament last season, linking up play between the defense and attack, controlling the tempo of games, helping to absorb pressure, distributing decent passes as well as improving the overall performance of his team. The Croatian International finished as one of the most impressive performers in the European tournament, stepping up at the vital moments to produce scintillating performances and guiding Real Madrid to claim their record third consecutive UEFA Champions League trophy during the campaign.